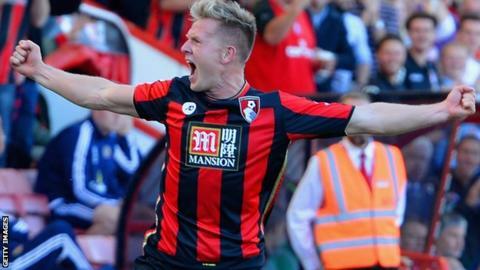 Bournemouth winger Matt Ritchie says his 25-yard volley against Sunderland was "one of his better goals". The Scotland international, 26, was modest about his left-foot strike which helped the Cherries to a 2-0 win at Vitality Stadium on Saturday. Ritchie's first goal of the season followed a fifth of the season from striker Callum Wilson. "I got a good first touch, luckily I hit it sweet and it nestled in the top corner," Ritchie told BBC Radio Solent. Ritchie's goal was his latest eye-catching strike for the Cherries following a stunning free-kick against Sheffield Wednesday in April during their Championship promotion run-in. "The technique of the goal today (against Sunderland) was probably better, but I think the moment against Sheffield Wednesday for me was probably one of the best of my career," he added. Bournemouth made five changes from the side which lost 3-1 against Norwich the previous week. "It shows how strong our squad is," said Ritchie. "We had a couple of injuries which obviously played a part, but we got a reaction from last week that we needed."